Seven Mile Beach, Grand Cayman is one of the most popular reasons why people visit the island. After all, it has been voted as one of the best beaches in the world! The beach which is located on the western tip of the Cayman Islands plays host to dozens of visitors annually. So, what makes Seven Miles so great? Well, some may argue it’s the length that almost guarantees you an uncrowded spot. While others argue it’s the sparkling clear, warm waters and pristine conditions of the beach. Whatever floats one’s boat I guess!! But one thing you are guaranteed is great relaxation on this beach. 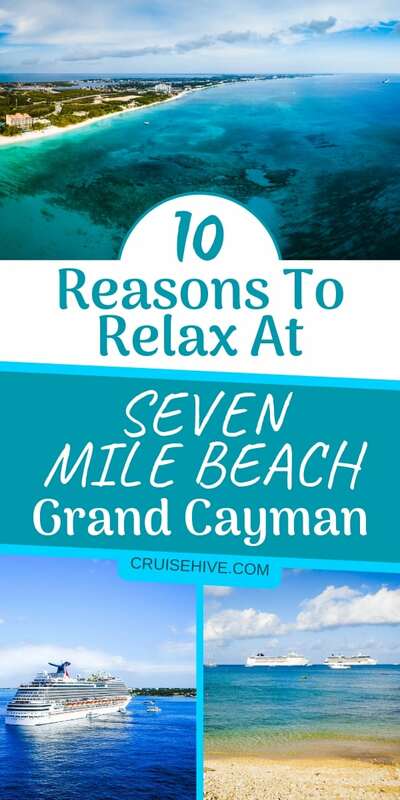 Don’t take our word for it, be the judge with these 10 Reasons to Relax at Seven Mile Beach, Grand Cayman. Seven Mile Beach features soft, silky coral sands. The kind you want to walk on forever. The calm waters that gently caress the sand keep it cool, making it easier on the soles of your feet. Since this is a public beach, you can find a secluded spot, lay a towel and enjoy uninterrupted beach bumming and sun tanning session. Crystal clear sparkling waters line this beautiful beach. Thanks to zero rivers draining into this beach, Seven Mile remains very clean and clear, perfect for snorkeling. The visibility of the waters at this beach is great, allowing excellent snorkeling conditions. The various shades of blue make for a pleasing sight. Note, however, the water entrance sharply declines a step’s size from the shore, so be careful when getting in. Thanks to the number of luxury resorts that line Seven Miles beach, you can expect a perfectly manicured beach. One thing you notice right away is how clean the beach is, devoid of any garbage. Please keep it that way. Check all these Beach Accessories before you go. There are several public accesses to the beach. However, the best is from the public beach stop. You can take a taxi or a bus from the cruise pier that charges roughly $6 per person each way and alight at the public beach stop. This part of the beach is likely to get crowded, hence walk further out to the left to find wider and less crowded stretches of sand to enjoy your beach day at. Walking along West Bay Road, you will also discover other entry points to the beach, where it’s not crowded and parking is ample. It’s illegal to hawk on Seven Mile beach; making this the perfect beach to relax on without the pressure of constantly getting flogged with things to buy. Enjoy a peaceful time on the beach, without anyone hassling you. If and when you want to indulge in some shopping, then find a row of gift and souvenir shops that line the beach. You can get things such as island-style clothing, swimming gear, and rent water sports equipment. The shops also sell crafts and pieces of art. If you are looking to splurge a little, then look no further than Camana Bay Shopping Center for all your luxurious shopping wants. However, for the best shopping, head into nearby George Town, Cayman Island’s capital, for more shopping. One place you shouldn’t miss is One 345 Swanky Shack located in downtown Georgetown, named by the New York Times as ‘one of the best-kept secrets in the Caribbean. It’s rare to find a long stretch of the uninterrupted sandy beach such as the Seven Mile Beach, which is actually about five and a half miles now. This partly believed to be due to the erosion of the beach on its southern ends. You can go to the beach early morning and take a blissful walk along the entire beach’s length. Taking in the great views of the horizon and the stunning beachside resorts found along the beach. While sinking your toes into the warm silky sands as the ocean breeze washes over you. Check these Beach Foot Pads, good for being on the beach. Some parts of the beach are a bit rocky, especially at the northernmost and southernmost shores. Which are usually made up of iron shore and rocks? As such, you might want to wear beach shoes. Don’t try running without proper muscle activation exercises though; the sand is not hard packed so you might hurt your legs. Being a resort-lined beach means, there is no shortage of places to eat, drink and change at. There are showers, bathrooms, restaurants, beach chairs, umbrellas, hammocks and beach cabanas available. Shade is in plenty from the palms and sea grape trees that dot the beach. There is also a park for the little ones. So, you only need to bring yourself, sunglasses, biodegradable sunscreen, and a towel to enjoy a day on Seven Mile beach. There are plenty of water activities that you can engage in at the beach. With such clear and calm waters, with minimal waves and mild currents, swimming, snorkeling is a great water sport here. You can also try paddle boarding, kayaking, parasailing, banana boat rides. Or even charter a catamaran for a seaside party. You’ll need a Waterproof Pouch for these type activities. Seven Miles has a wide stretch of sand but depending on the number of cruise ships in port, it can get crowded. Luckily, the beach is large enough that if you walk further from the people, you are bound to find a lovely secluded stretch to enjoy your beach day on. The Cayman Islands have a classy affluent atmosphere that transcends to Seven Mile Beach. If you are looking to beach bum like a celebrity, then this is the place. Luckily, it costs nothing since the beach is free. It’s also a terrific photo opportunity for those Instagram worthy beach pics. There you have it, 10 wonderful ways you can relax at Seven Mile Beach. Please note that there are plenty of other things you can do nearby the beach. Like explore the stunning metropolitan Caribbean town that is George Town, go on food tours, charter a boat to stingray city, visit hell park or the turtle marine park. So, in case you want to take a break from the beach, rest assured there are plenty more activities to indulge in. Hope these reasons or less have got you sold on the charming aspect of Seven Mile Beach and are now busy planning the ultimate beach day in the Caymans. If so, we wish you a very splendid time. Happy Cruising! !